Get a comprehensive overview of all user activity on files in your OneDrive for Business environment with O365 Manager Plus' preconfigured file operations report. This exclusive report records critical changes to confidential files and folders in your OneDrive for Business environment, including information on files deleted, moved, copied, renamed, and restored to help you mitigate internal security breaches. With O365 Manager Plus, the complete Office 365 solution, these reports can be scheduled to run at fixed intervals, emailed to administrators, and exported to CSV, XLS (Microsoft Excel), PDF (Adobe Acrobat), or HTML formats. Keep track of access to critical files and folders. Identify the types of operations performed on files and folders. Get details on who did what, when, and from where. 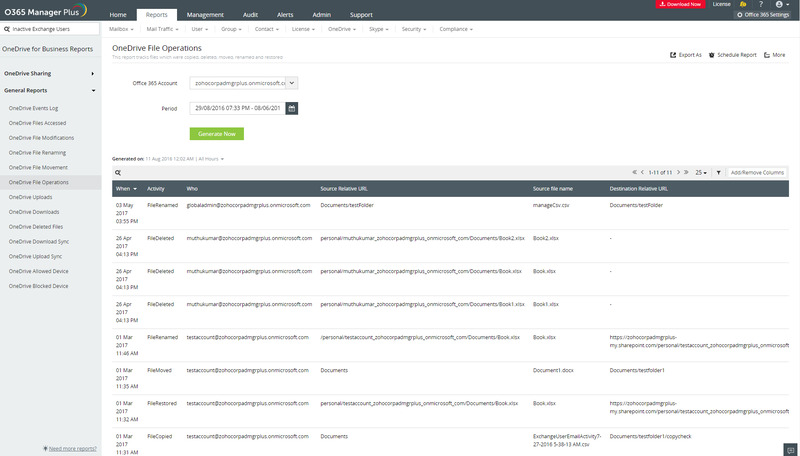 This report also highlights any anomalies in the file activity logs so you can strengthen your security. O365 Manager Plus also provides a built-in filter to customize your OneDrive for Business file operations report so you can see just the information you need. You can even save this information as a separate custom report to view alongside all other preconfigured reports. Furthermore, you can schedule when reports should be generated and export them to PDF, XLS, HTML, and CSV file formats. As your organization grows, your OneDrive for Business also grows proportionately, meaning it's a lot harder to monitor files, folders, and user activity. O365 Manager Plus offers reliable auditing and reporting to help you manage files and folders while ensuring their security.